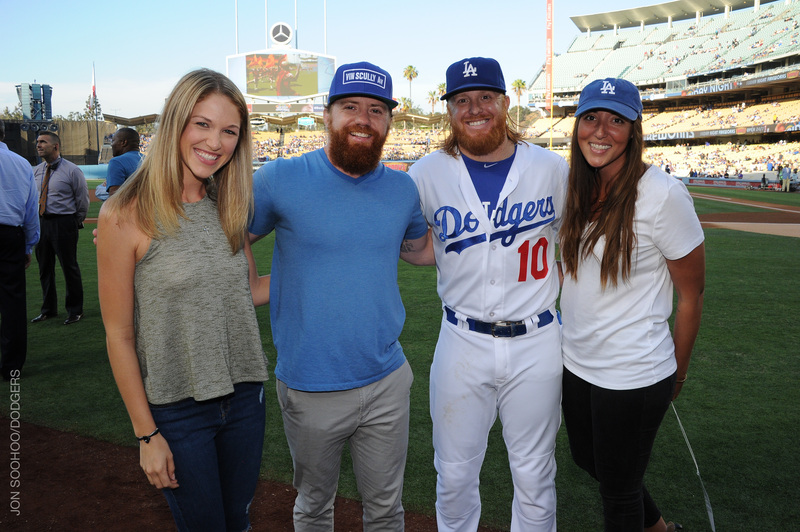 The Saldana family were guests of Justin Turner and his girlfriend Kourtney, far left, on Friday. It started with an Instagram post by lifestyle blogger Jacqui Saldana. Turner was tagged in the post. And to the young Pasadena couple’s surprise, he responded. Dan Saldana, Jacqui’s husband and a lifelong Dodger fan, looks so much like the Dodger third baseman that he was working out at the gym once and a little boy started recording him with the thought that it was Turner. It wasn’t the resemblance that moved Turner and his girlfriend Kourtney to respond. They knew of the story that rocked the Saldanas’ world. So they reached out. In May 2014, Jacqui and Dan’s son Ryan, just 3 years old, was hit and killed by a truck while playing outside of his cousins’ house. The Saldanas used to take Ryan to Dodger games often. He liked sports. He was very active. When daddy came home from work, he would want to go outside and hit. He loved cooking with mommy in the kitchen. He loved Disneyland. His hair was long and curly — red of course, like daddy and like Turner. Days after the tragedy, a Saldana family friend posted a memory of the boy with a hashtag #redballoonsforryan. It went viral. There was an outpouring of support for the family from all points of the country. TV news and newspapers — even one of the most well known British newspapers The Daily Mail picked up the story. It was five weeks ago that Jacqui wrote the post on her Instagram account. Turner and his girlfriend remembered them. The Saldanas were guests of Turner and were treated to on-field pregame passes and met him for the first time prior to Friday’s game. “It took our breath away,” Jacqui said of meeting Turner. “Once we got past the first introduction it was like talking to someone you’ve known forever,” Dan said. Turner set the parents up with two of the best seats in the house. Yes, they’re parents again. They have a 6-month-old daughter named Mila who looks just like Ryan, who they continue to be inspired by.